These Hypoallergenic Comforters are filled with USDA Certified Organic Superfine Merino Wool, and are covered in 300 Thread Count Pure Certified Organic Cotton Sateen. The comforter has been according to OKO TEX 100 & GOTS standards to ensure the fabric is safe and free of any VOC's, arsenic and carcinogens. It has been manufactured with fair trade labor and environmentally friendly practices. Wind power is used as an environment friendly energy source. Organic certifications for the comforter come from Control Union, Oko Tex, ISO, Ceres and Woolmark. In addition, Organic Trade Association, Better Business Bureau, International Federation of Agricultural Organic Movements and Co-op America have approved the manufacturer as a member. 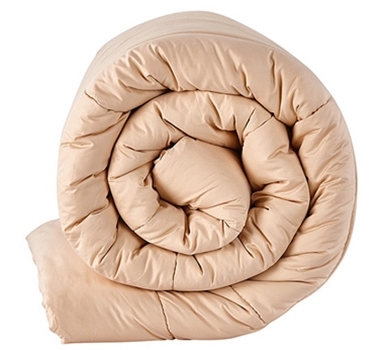 A washable duvet cover is strongly recommended for the comforter. King - 102" x 90"